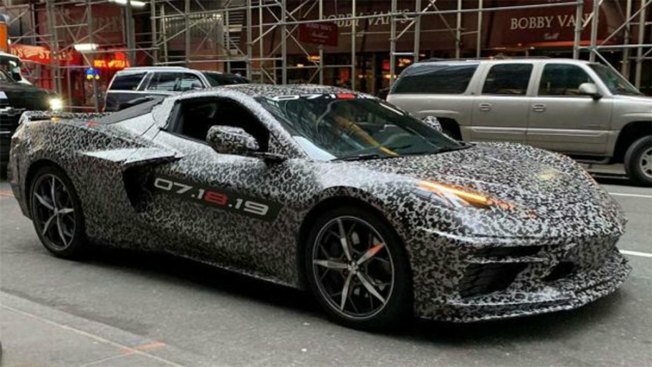 The Corvette has long been billed as has long been billed as "America's sports car"
A camouflaged 2020 Chevy Corvette C8 in New York on April 11, 2019. The auto industry is always rife with rumors, but one particular topic has kept the rumor mill working overtime for decades. And it's finally come true. On Thursday, General Motors finally ended what has been one of the biggest mysteries in the auto industry, posting a link on its website and on social media announcing the "next generation Corvette reveal event" on July 18, along with photos of a barely camouflaged car that would be the first-ever mid-engine version of the Chevrolet sports car. "The Next Generation Corvette is the most anticipated Corvette ever. It's the sum of each generation before it, but will stand alone as the new standard of performance," the company said. It might seem like a dry topic, the sort of thing gear heads would debate over a case of beer while changing their own oil, but the news has set the automotive Twitterati ablaze. While the Corvette may not generate the sort of sales you'd expect of a Chevy SUV like the new Blazer, it has long been billed as "America's sports car," giving a halo not just to GM but the American auto industry, as a whole. The latest version, known to fans as the C7 – for the Corvette seventh-generation model – is an impressive and well-respected piece of machinery, but not quite a world-beater. The C8, it is widely expected, will be the first version to give a serious challenge to the likes of Ferrari, McLaren and Lamborghini. Corvettes, up until now, have put their engines upfront, pretty much like anything else that you'd find in your typical showroom. With rare exception, all of those European brands traditionally mount their engines amidship, or even in the rear, layouts that translate into markedly better vehicle dynamics. With its big V-8, the Corvette is plenty quick. It just can't keep up with the likes of a Ferrari sweeping through the corners. It's not that GM hasn't thought about building a true world-beater. Coming up with a mid-engine model was the one unfulfilled dream of Zora Arkus-Duntov, the Belgian-born engineer widely known as "the father of the Corvette." Since the first 'Vette was produced 66 years ago, in fact, there have been any number of prototypes, none making it into production. The Corvette itself nearly went away during the automaker's economic collapse a decade ago. The current model, the C7, was officially put on hold as GM went through bankruptcy, though a secret "skunkworks" team kept plugging away until the automaker could loosen up the purse strings again. The current model has widely been hailed as the best Corvette ever — but ever so slightly short of being that true Ferrari challenger. Over the last several years, the rumor mill began to heat up, suggesting that this time GM was serious. At first, there were a few odd sightings, skeptics taking them little more seriously than balls of Sasquatch fur. In February, by sheer happenstance, a convoy of C8 Corvettes — out testing in the hill country east of San Diego — got caught up in the same, freak snowstorm as a convoy of automotive journalists who were running the same road in the new Kia Soul. Still, GM officials repeatedly look baffled when asked at various press events what their plans were. The new model failed to appear at any of the big 2019 auto shows. Not Detroit, not Chicago, not Geneva and, no, it won't be in New York this month. But just a week before the annual auto show season wraps up, GM has released the first official images of the C8 Corvette which is likely to debut as a 2020 model. One of those shots shows a beaming Mary Barra, the CEO clearly knowing she has pulled off the engineering miracle that predecessors going back more than six decades couldn't accomplish. For now, the automaker isn't saying much more beyond it's reveal date, but the rumor mill has gotten things down to a fine art and plenty of specifics have begun to leak out. Like the current model, Chevrolet will steadily role out a series of fast, faster, fastest models, starting with a new Stingray rated at somewhere between 500 and 600 horsepower, according to senior GM executives who asked not to be identified because the plans aren't yet public. At the top end will be an all-new edition, an homage dubbed the Zora, that will take dead aim at Ferrari, like the Italian supercar maker borrowing a few tricks from Formula One racing, executives said. The Corvette Zora is expected to pair a twin-turbo V-8 pumping torque to the back wheels with an electric motor up front, the package making more than 1,000 horsepower, they said. One thing isn't expected to change. Where the Europeans routinely command six figures for their machines, the C8 Corvette is expected to start at around $62,000 — or about $5,000 more than the current C7 Stingray. The Zora could double that base price, but would still be a bargain compared with what Ferrari, Lamborghini and McLaren command for similar levels of performance, executives said. Of course, it remains to be seen whether the C8 is anything more than "the stuff that dreams are made of," as Humphrey Bogart's detective Sam Spade said in "The Maltese Falcon." But after decades of promising to one day build a truly world-class supercar, Chevrolet may finally be ready to deliver.